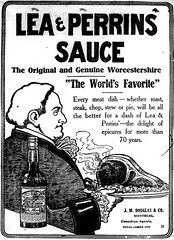 Mix the minced beef, American Barbecue Seasoning, Worcestershire sauce and egg together in a large bowl. 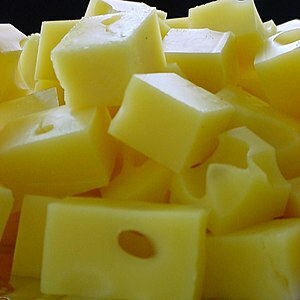 Cut the cheese into 4 cubes. Grill on the barbecue for 10-15 minutes, turning occasionally. In this video, Betty demonstrates how to make her version of Cheesy Peas. This recipe was inspired by our recent trip to Michael’s Restaurant in Ravenna, Kentucky. I have made almost every item that we found on the salad/buffet bar in bettyskitchen. I also have Blakemore peas in bettyskitchen, which is a vegetable side dish that is a little more elaborate than this simple version of Cheesy Peas, and you may prefer it. 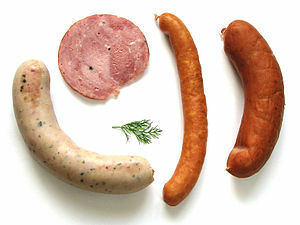 So, was it the sausage or the cheese that inspired you to open this post and get your mouth watering? 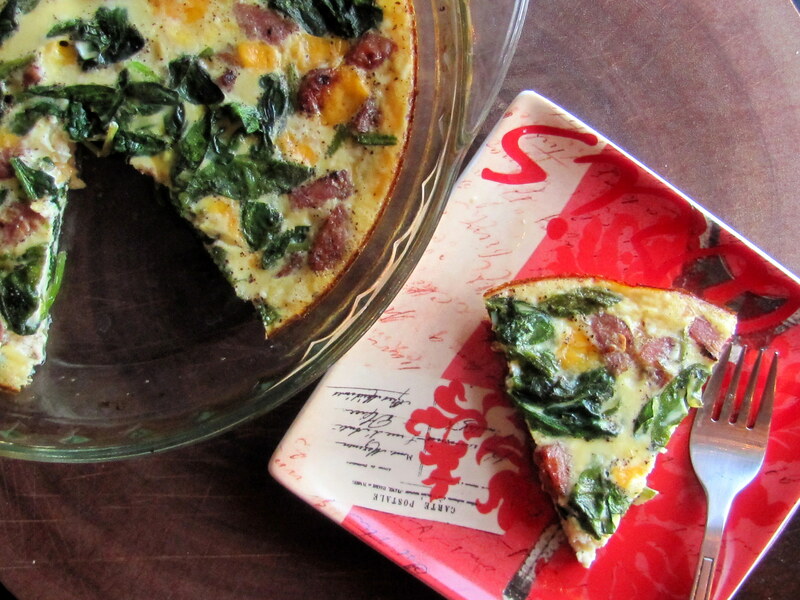 Quiche is one of my favorite dishes with it’s flakey and buttery crust and creamy egg filling. Oh and add cheese and game over! Nevertheless, quiche this indulgent often make me feel a bit lethargic. Hello, food coma! Why not omit the crust and make the filling a bit lighter but still flavorful?! 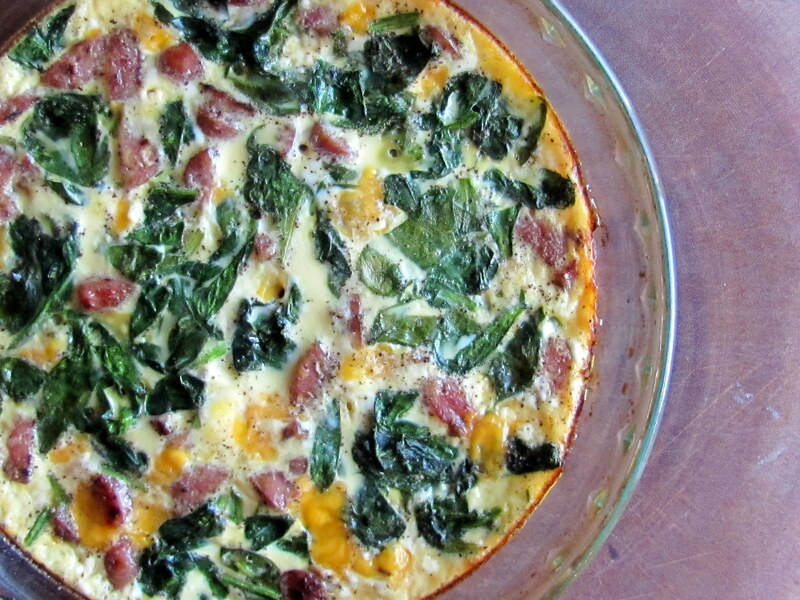 You’ll enjoy the health benefits of this quiche. 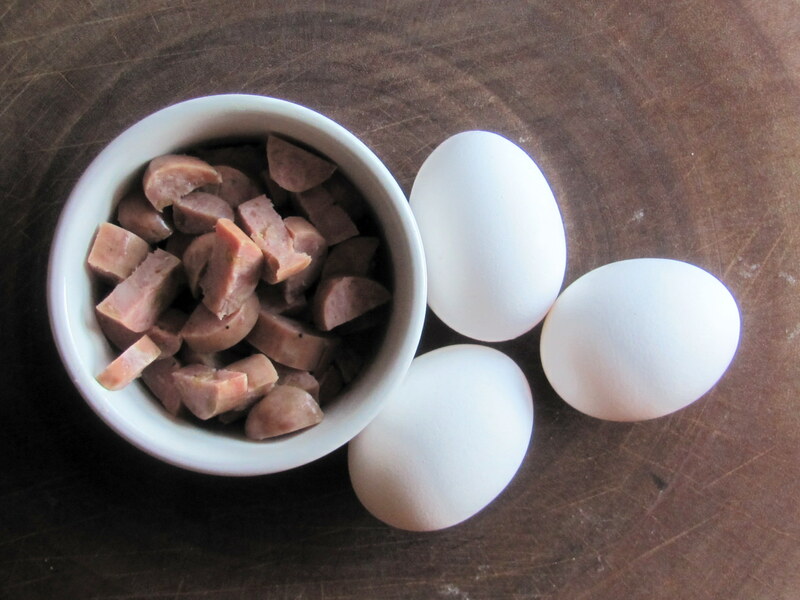 The chicken sausage and eggs contain loads of protein. Not to mention, the spinach contains phytonutrients for anti-inflammatory and ant-cancer benefits. The vitamin K from spinach is essential for maintaining bone health. 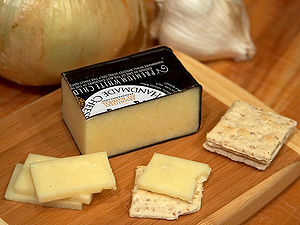 Did I mention the sharp cheddar is low fat?…Eat up! In a medium bowl, whisk together milk, 2 whole eggs, 1 egg white and sea salt and pepper to taste. 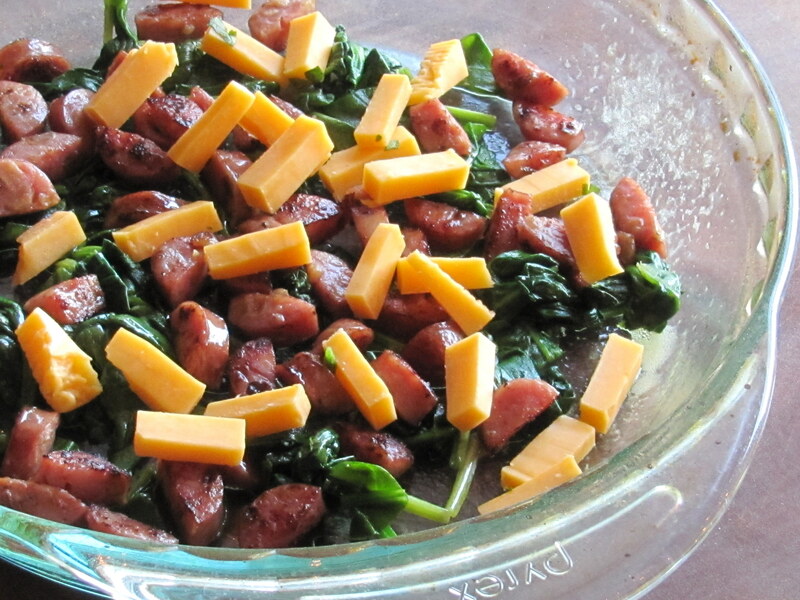 Pour over the spinach, cheddar and sausage. Bake for 30 to 35 minutes. Remove and place on a wire rack. Slice and enjoy!! 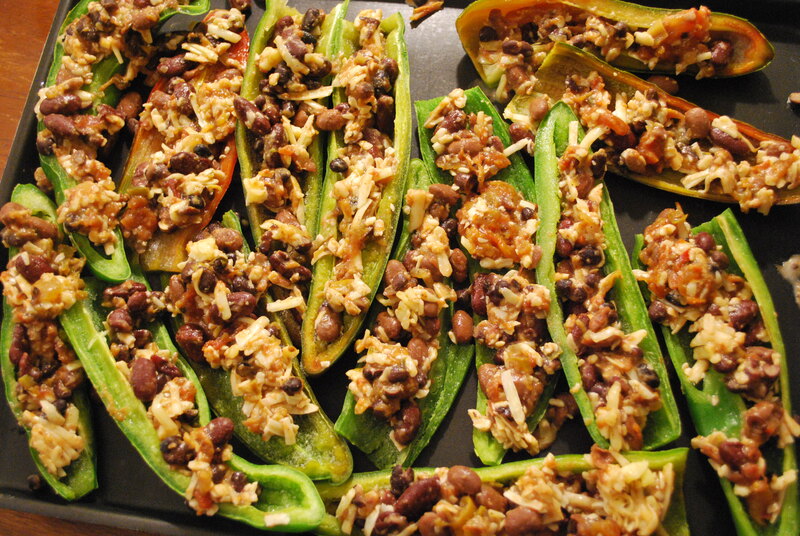 Literally a 15-minute winter dish if you’ve already frozen some peppers and canned some salsa. A Cast Iron standard, great appetizer or side dish. Healthier and better than the deep-fried version. Anaheim peppers are always particularly prolific for us. I prepared these for the freezer by cutting them in half, removing the stems and seeds, and blanching them in boiling water for no more than 30 seconds. Then I froze them in ziplock bags. They freeze wonderfully and our guests really appreciated a fresh-tasting pepper in the middle of winter. I usually also freeze some peppers already chopped up, this way they take less space in the freezer and are ready to throw into whatever I’m cooking. 6-10 Anaheim peppers, cut in half and seeded. Ours were blanched and frozen last summer. Small jar of salsa. Ours was canned last summer but store bought or fresh made will also work. 1 can of any kind of beans. I’ve used white, black, or garbanzos. Mix salsa, beans and cheese. Spoon into the center of the peppers. Bake at 350 for 10 minutes or until cheese is melted and peppers are heated through. These are the little savory morsels that inspired Irish Food Day at my house. Stand in awe of the Irish Nachos! If I had not been surrounded by my lovely family I would have made inappropriate noises until this platter was EMP-TY! Seasoned red potatoes with bacon and cheese are the recipe for culinary seduction. Make a note of that. I can’t be the only one. My mouth is dominated by a sweet tooth but this dish, although simple, has such flavors that will make me ask my Irish Coffee Cake to hold on a sec. These are pretty easy to make but regardless of the difficulty it was extremely nice of Deanna and Andy to bring so much food for Irish Food Day! I’m very proud to share with you the recipe for Irish Nachos. Spread your potatoes on a baking sheet and bake per package directions until golden brown. Then remove potatoes, cover with shredded cheese, bacon and green onions and bake until cheese is melted. I’d double that recipe if you plan to share. For some reason I am just crazy for those nachos! I wanted to give the nachos and stew their own posts but St. Patrick’s Day is coming faster than I expected so I had better share this Guinness Stew recipe with you before we run out of time. My sister Deanna made this recipe up by herself. She compiled different stew recipes and made it into something she thought it should be. She said it was weird that she couldn’t find a stew recipe with tomatoes, but she added them to her stew “because they should be there!” When she gave me the notes for her recipe she told me, “I just picked things I liked and made stew with it!” I love it. You should try this and feel free to improvise! Preheat your oven to 500 degrees. Heat a large pot (that is also oven safe), add your cooking oil and brown your beautiful beef. Season with salt, pepper and cayenne. Add your onions and carrots, stirring and enjoying the delicious fragrances! Let your tomatoes join the party along with 1 bottle of Guinness and the thyme. Cover your pot and bake in the oven for about 3 hours. About 1 1/2 hours into the baking time add another 1/2 bottle of Guinness. Serve withIrish Soda Bread for an Irish theme. Thanks for the amazing post, you earned your spot on the cooking channel! In this video, Betty demonstrates how to make an impressive and flavorful Elegant Chicken Cordon Bleu. This entrée is made by wrapping uncooked chicken around slices of ham and Swiss cheese. Then it is breaded and fried to a golden brown. When cut with a knife, the melted Swiss cheese delightfully oozes out of the center. This is an elegant and delicious entrée for a dinner party. In this video, Betty demonstrates how to make Broccoli with Cheese Sauce. This is a quick and easy recipe. Most of it can be made ahead of time and put together at the last minute!